There are as many ways to think about art as there are to create it. Join ARTdart columnist, Pamela Beck, in this 5 part feature interview series with 5 participants from Art Basel Miami, as she explores and considers the different perspectives that define the art world. Walter Matthews, a painter in the Fine Arts Program, is a senior at Ringling College of Art and Design. PB: You traveled with other Ringling College students. How many went and how did the group get organized? WM: There had to have been thirty to forty people. All juniors and seniors go every year for three to four days. Before the trip, we had previously broken into groups and then were provided a faculty chaperon for each group. We all took a bus provided by the school and all students stayed in a hostel on South Beach. PB: Which fairs did you visit and which were your favorite? 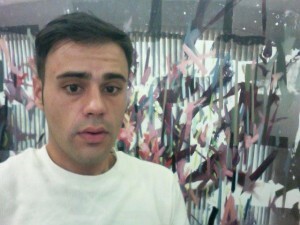 WM: I visited Pulse, Aqua, Art Miami, Nada, Scope and Art Basel. My favorite was Pulse they had a well-organized layout that made it easier to look at work. I liked Art Miami as well though. PB: Did the group stay together during the days and nights? What did you do? WM: Yes, our group stayed together during the days and nights, but we were allowed to do as we liked after meeting for whatever fair we were told to meet at for that day. After fairs we went bar hopping around South Beach for the most part. PB: How did this fair experience affect you? There was so much to see and do. WM: The fair experience usually affects me in the same way each year. It’s like going to a buffet and then leaving sick because you’ve eaten too much. There was plenty to do. I probably averaged four hours of sleep each night. We would look at art all day then take advantage of the nightlife in the evening. PB: Did you see any new work that you particularly liked? Please describe it. WM: I came across a series of paintings at one of the convention centers I really enjoyed. I believe it was at Art Miami, in Mike Weiss gallery booth. 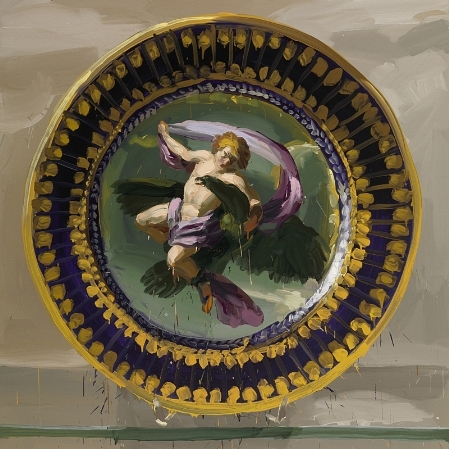 There, Jan De Vliegher had a series of oil paintings of antique porcelain plates. They were very painterly and the brush handling was very impressive.